As I drove on the Thika Superhighway on the weekend before Uhuru Kenyatta’s inauguration on Tuesday, the road was decorated with flags of different countries. At the foot-bridge next to National Youth Service (NYS) Headquarters, the Tanzanian flag flew sublimely. Other flags including the Nairobi City Council flag decorated the Thika Superhighway that headed towards Kasarani, the venue of the inaguration. The Office of the Government Spokesman in Tanzania, had on 24 November issued a press statement saying that President John Magufuli would attend Mr. Kenyatta’s swearing in on 28 November. Days before Mr. Kenyatta’s inauguration, NASA leader Raila Odinga, a close friend to Mr. Magufuli flew to Zanzibar, where it is reported that the two met. Mr. Odinga’s trip to Zanzibar which came a few days after he jetted back to Nairobi from an overseas trip sparked debated and controversy. 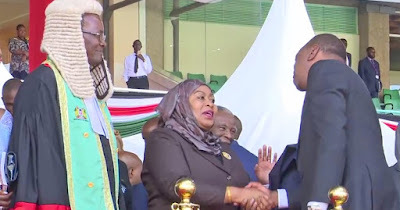 On the inauguration day, Tanzania’s State-House issued a press release saying that Vice President Mama Samia Suluhu Hassan had arrived in Nairobi, where she was to represent President Magufuli. Several Kenyan media quickly labeled this as a Magufuli snob of the inauguration. Even before the official statement from the Tanzanian government, there was speculation whether Magufuli would have attended the swearing in. A few weeks back, Tanzania and Kenya had a frosty diplomatic incident. The Tanzanian government had auctioned 1,000 cows that belonged to Maasai pastoralists that had crossed into Tanzania for pasture. Veterinarians in Tanzania earlier in the month of November burned over 6,000 chicks which had been illegally imported from Kenya. Following the auctioning of the cows, President Magufuli made outrageous remarks saying “Tanzania is not a grazing land for cattle from a neighboring country.” This statement was not received well in Kenya. 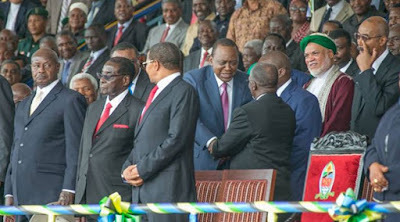 Tanzania-Kenya relations have in the past been frosty and these two episodes in November can explain the relations. President Magufuli and Mr. Odinga are close friends since their days as ministers of public works in their respectful countries. Tanzania’s main opposition party Chadema was known to be close to Mr. Odinga’s party ODM. In the elections of 2007 and 2013, Chadema provided campaign support to Mr. Odinga and his party. Tanzania’s ruling party CCM, though not stated outright, has been friends with Kenya’s ruling parties – KANU and Mr. Kenyatta’s party Jubilee. Tanzania’s former president Jakaya Kikwete was seen as a close friend to the Kenyatta government. The defection of Edward Lowassa from CCM to Chadema in 2015 saw Chadema rescind its support for Mr. Odinga. Mr. Lowassa was a close friend to Mr. Kenyatta and Chadema’s retraction from supporting Mr. Odinga and his party ODM was no brainer. As the old saying goes “a friend of my enemy is my enemy” meant that Chadema had to shift allegiances as a party and openly declared support for Kenyatta’s reelection in 2017. CCM as a party remained silent on this. Mr. Lowassa was invited by the Jubilee Party in a number of campaigns in Maasai areas, where he campaigned for Kenyatta. NASA Tallying Center in Tanzania? During the presidential TV debate, Mr. Odinga was asked to clarify the allegation that his coalition’s tallying center was in Tanzania. During this debate skipped by Mr. Kenyatta, Odinga was evasive and played down the allegation. This episode, though never clarified further pointed to the closeness between Odinga and Magufuli. It was even speculated that President Magufuli was offering some campaign logistical support to Mr. Odinga. Outspoken Kenyan MP Moses Kuria even said that Magufuli was conspiring with Raila Odinga to rig the elections. 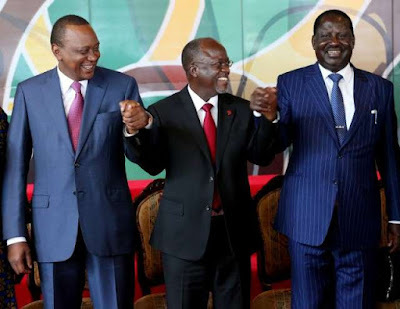 It was evident during the campaign season in Kenya that Mr. Lowassa and Chadema were courting Mr. Kenyatta and his Jubilee Party hoping that they would reciprocate in the 2020 elections in Tanzania. After been sworn in, Mr. Kenyatta in elaborate speech said that Kenya would treat citizens from the East African community like Kenyans and that “they will only need a national identification card to travel, work, do business, own property, farm and even marry and settle in Kenya.” As he made this pledge, the television cameras beamed at Uganda’s president Yoweri Museveni and Rwanda’s Paul Kagame. If President Magufuli had attended, then the television cameras would have focused on him. Tanzania has been accused of dragging the integration process through restrictive policies. As a Tanzanian who has grown up and lived in Kenya, this promised by Kenyatta was a welcome one. “We only hope that Tanzania would reciprocate,” one of my friends told me. The inauguration was attended by about 47 foreign delegations and heads of states. At the luncheon at State House, the Israeli Prime Minister Benjamin Netanyahu met with the African leaders where they discussed various bilateral and multilateral issues. Images of VP Samia Suluhu Hassan visiting shot opposition MP Tundu Lissu at a Nairobi hospital were released on Tuesday evening after the inaguration. She was, according to the reports conveying greetings from President Magufuli. A Financial Times newspaper report on the shooting of Tundu Lissu was also released on Tuesday. In the report, Lissu blamed president Magufuli, where he alleges that it because of his criticism of his government. Had President Magufuli attended the inauguration, it was expected that he would have visited Lissu in hospital just like the Vice President did. 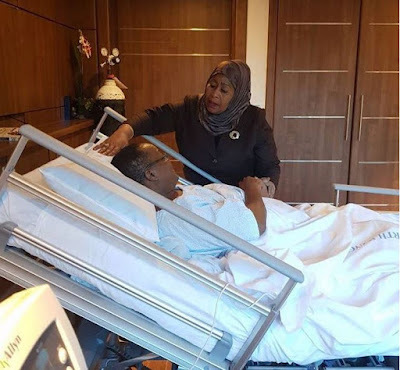 “Greet the president, tell him am thankful,” Lissu told Mama Samia Suluhu. With the FT report, Magufuli’s meeting with Lissu would have been extremely awkward. 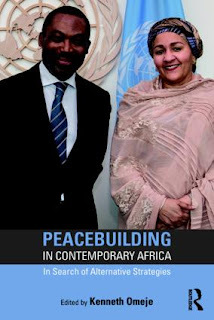 Mr. Lowassa just like former President Kikwete were officially invited to the event. Kikwete through his official Twitter page congratulated Uhuru Kenyatta, but said he was not able to attend due to prior engagement. 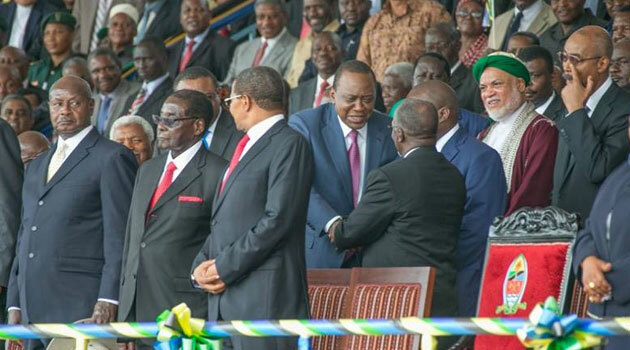 Having shown support to Kenyatta, Lowassa savored the occasion. He sat together with his wife Regina at the VIP dais smiling and relaxed – maybe praying that Mr. Kenyatta will in 2020 attend his inauguration! President Magufuli has recently lamented that being a president is “frustrating.” As he spoke during his abrupt visit at the port in Dar es Salaam, Magufuli decried the lack of will to fight corruption in the country. Since assuming office in 2015, Magufuli has made a handful of international travels with Ethiopia the furthest he has gone. Magufuli may just be consumed by domestic obligations which have curtailed his international travels. His party CCM had just won by a ‘landslide’ in the councilor elections. Maybe he was savoring the ‘victory’ at home. You never know!